But how can this advantage be quantified? 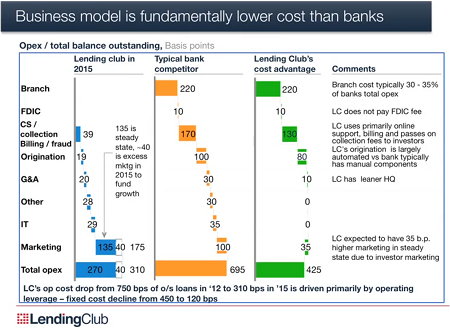 For 2015 the chart projects a cost advantage for Lending Club of over 400 basis points over banks. This is huge. Not surpisingly Lending Club has the biggest advantages by maintaining no branches and in collection and origination. or marketing Lending Club will have higher costs than banks. Laplanche foresees that more and more banks will actually make use of p2p lending services as platforms to invest or to fund their borrowers to profit from the faster processes and the lower costs. At the conference Laplanche announced the first cooperations with banks and says he expects more to come. 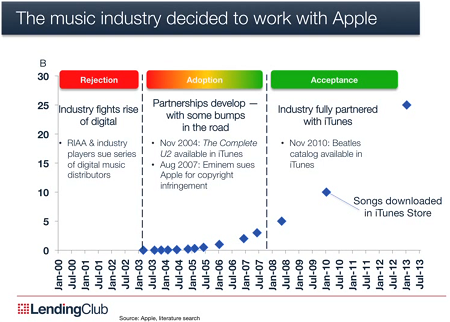 His reasoning is that p2p lending like many other innovations will pass through 3 stages: rejection, adoption and then acceptance by the incumbents. Following this argument, p2p lending could right now be early in the stage of adoption by the industry. Imagine if Lending Club wasn’t saddled with the cost of SEC registration and the need to interpose a licensed lender… the cost advantage of ‘pure’ P2P lending platforms in the UK over UK banks has to be much greater still.